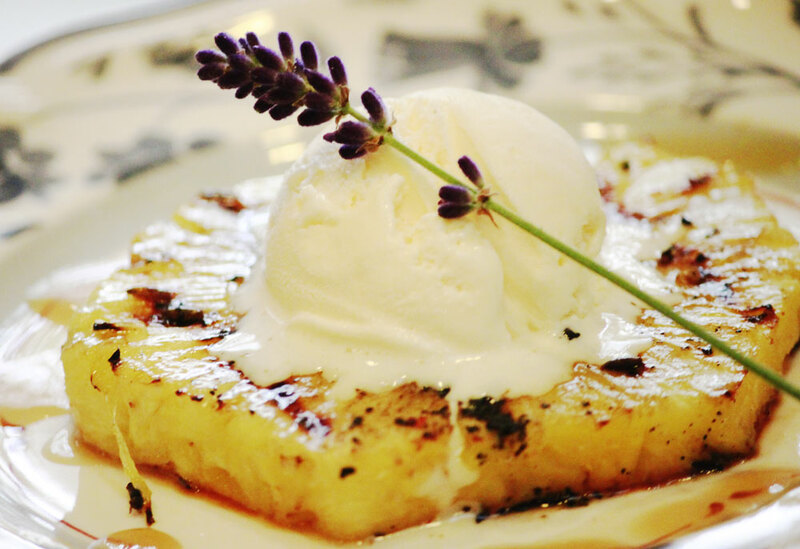 Adding the flavor of lavender to tea and everyday drinks is easy and exotic. Easy and exotic don’t always go together, but when they do, the moon and the stars line up, delivering magic in the form of a delightful treat. 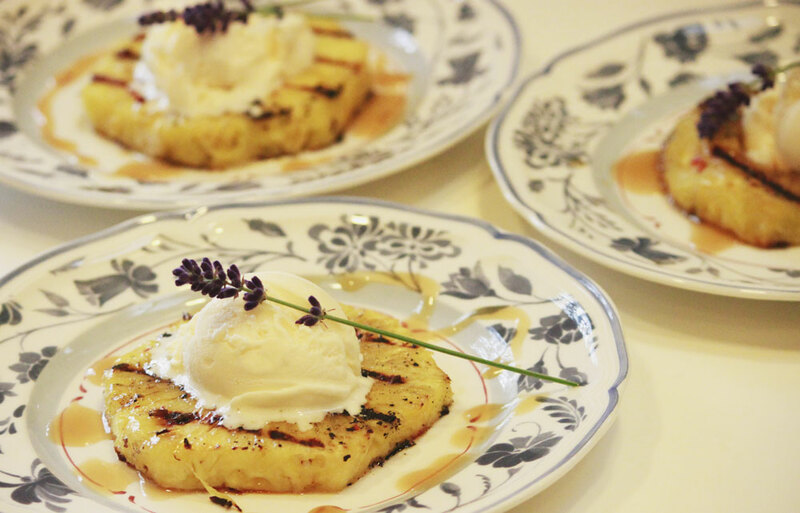 Sipping a cup of lavender tea tops my list of favorite ways to savor this evocative herb. I became acquainted with lavender tea in an unlikely place, Maui. 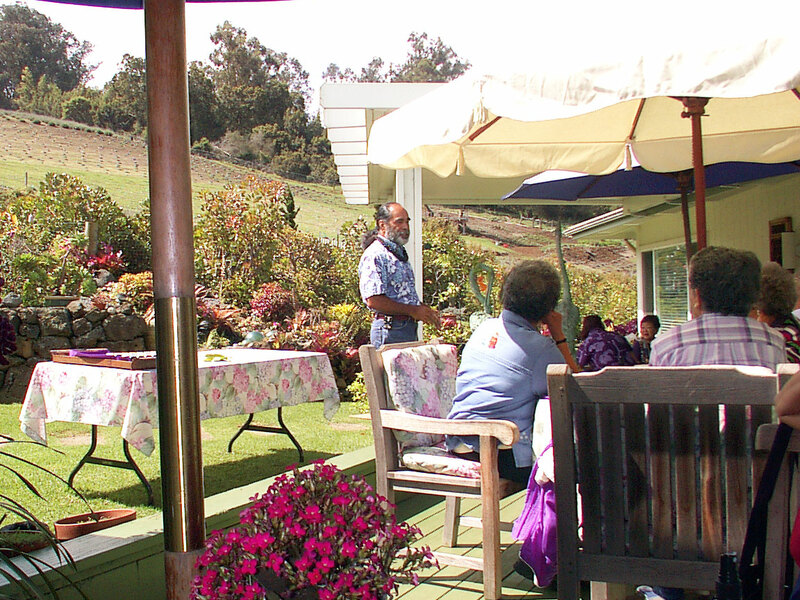 A trip to the upcountry led me to a garden paradise called Ali’i Kula Lavender where I attended a tea seminar. As I pulled away from the sunny, sandy beaches stretched along the Kanapali coast and drove up into the interior of Hawaii’s second largest island, the landscape changed. Fields of lettuce, herbs, carrots and cabbages spread like a colorful carpet on either side of the highway. The bright blue skies gradually became gray and somewhat misty as I followed the highway into the mountains, right into the cloud cover. 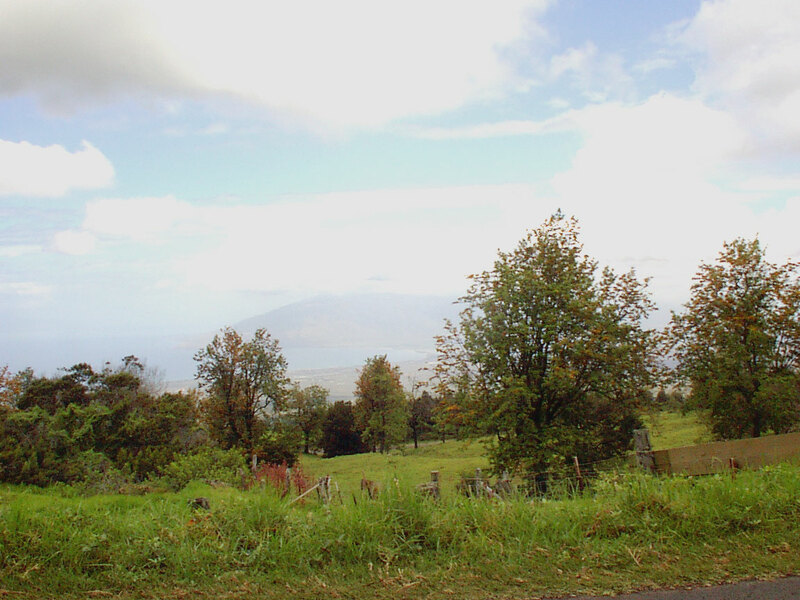 Ali’i Kula Lavender perches on a hillside high above the Pacific Ocean with a panoramic view of Maui. The property looks down over the isthmus connecting West Maui with the rest of the island. Mount Haleakala, the highest peak on Mau, towers above from the east at 10,023 feet above sea level. 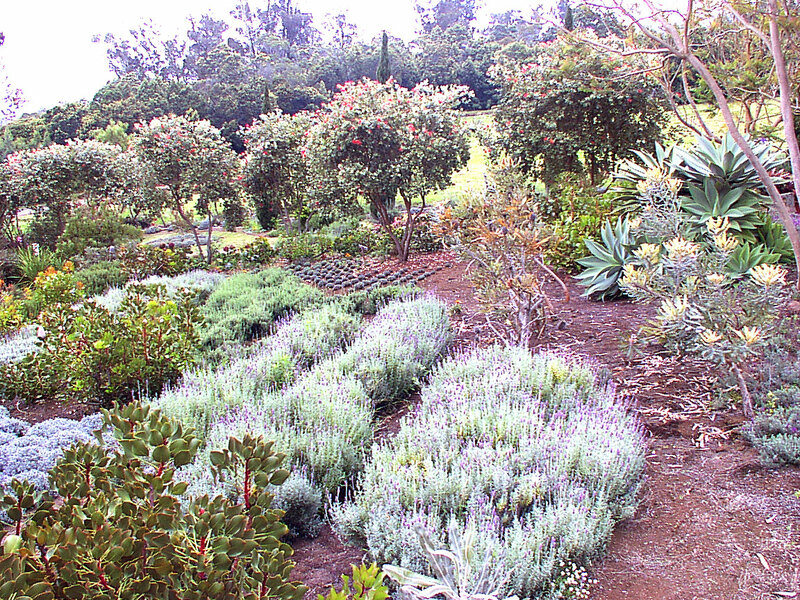 With well-drained, rocky soil and a western exposure to the Hawaiian sun, lavender flourishes here, enjoying optimal conditions. 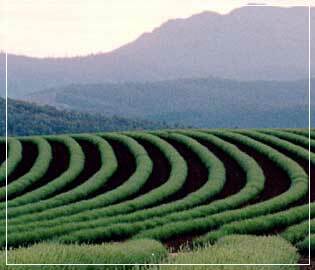 More than 12,000 plants flow along the contours of the hillside like purple streams. Protea shrubs and bottle brush trees are scattered among the clumps of lavender plants. Birds of paradise, ginger, scented geraniums and plumeria accent the garden, adding color, size, texture and fragrance. Their scarlet, pink and pastel petals contrast with the cool blues and purples of the lavender. The scent, reminding me of expensive perfume, blends tropical, floral and pine-like notes. Evergreen cypress trees and deep glossy green-leafed avocado trees stand by like proud guardians. Playful white butterflies and delicate iridescent bluish-green dragonflies (called Pinau in Hawaii) dance among the blossoms. A bronze statue of the seated Kaun Yin, goddess of mercy, adorns the garden. The park-like grounds, home to 45 varieties of lavender, look like a Monet painting. “Aloha. Welcome to Ali’i Kula. 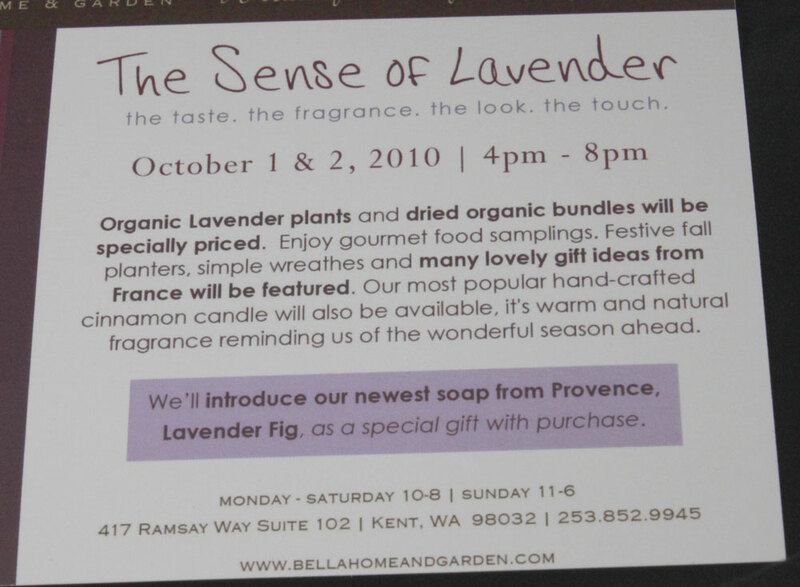 Please try a cup of our lavender-chamomile tea,” a young woman greeted me as I arrived for the herbal tea seminar. The steaming cup infused the air with a floral fragrance. 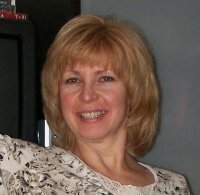 I felt calm and serene, up in the clouds, a million miles away from traffic, news and routine problems. Could this be heaven? I wondered, as others slowly gathered to hear the Hawaiian healer, Kahu Lyons Kapi’oho Noane talk about herbal tea. “As a young boy, I lived in a very remote part of Maui,” Kahu Naone explained. “My grandmother told me drinking herbal tea promotes health and feeling good.” Kahu is an informal title meaning guardian or caretaker. Beginning at the age of six, he learned ancient Hawaiian healing practices from his elders. Now as a middle-aged man, Naone shares his knowledge of herbal tea with the tourists at Ali’i Kula. Dressed in a blue floral Hawaiian shirt, dark blue beads and denim jeans, Naone has a full beard, dark with a touch of gray. His bushy eyebrows add balance to his face. His long black hair is pulled back and tied at the nape of his neck in a thick pony tail. His brown – nearly black – eyes glowed as he talked about the healing attributes of herbal tea. “The roots of the plant reach down into the soil to find life-sustaining nutrients, while the leaves face up to the sky, absorbing energy from the sun,” Naone’s soothing voice informed us. Next he instructed us to experiment with three ways of drinking our tea. “First, take a sip and allow the tea to sit in your mouth for a moment before swallowing. Now take a drink and move the tea over your entire tongue, the tip and the sides. Finally, slurp the tea; don’t be afraid to make a loud noise. Can you taste the difference? When you bring air into the tasting process, the flavor is amplified.” The herbal tea tasted light and refreshing, imparting a garden-like flavor. Hawaiians traditionally view the mind, body and spirit as one. Could anything be more natural or carefree than to take buds and leaves from lavender plants and steep them in boiling water, creating a light and aromatic drink? 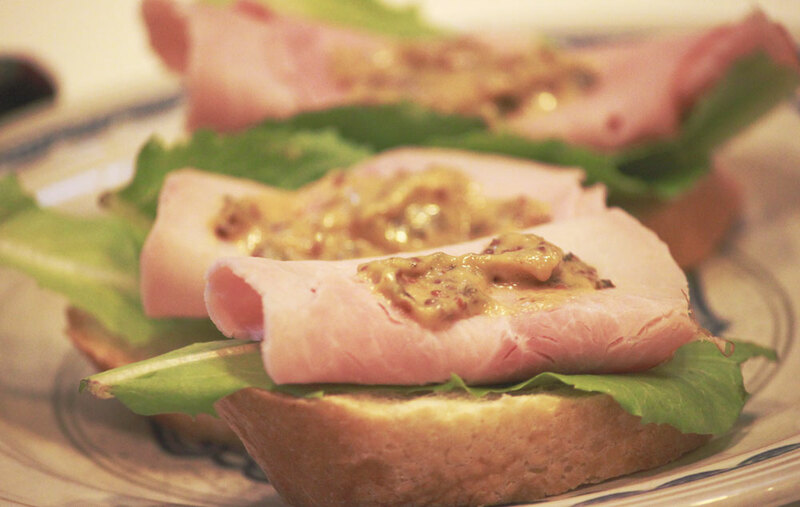 Cover Brie Round with pesto, mango or pear chutney. Bake at 350° for about 10 minutes. (Microwave for a minute or two). Cover Brie with cranberry sauce, a little bit of triple sec. Sprinkle with brown sugar, and bake for about 10 minutes. (Microwave, also). Sprinkle a little Jack Daniels on Brie; add a little bit of brown sugar and some sliced almonds. Bake for 8-10 minutes. 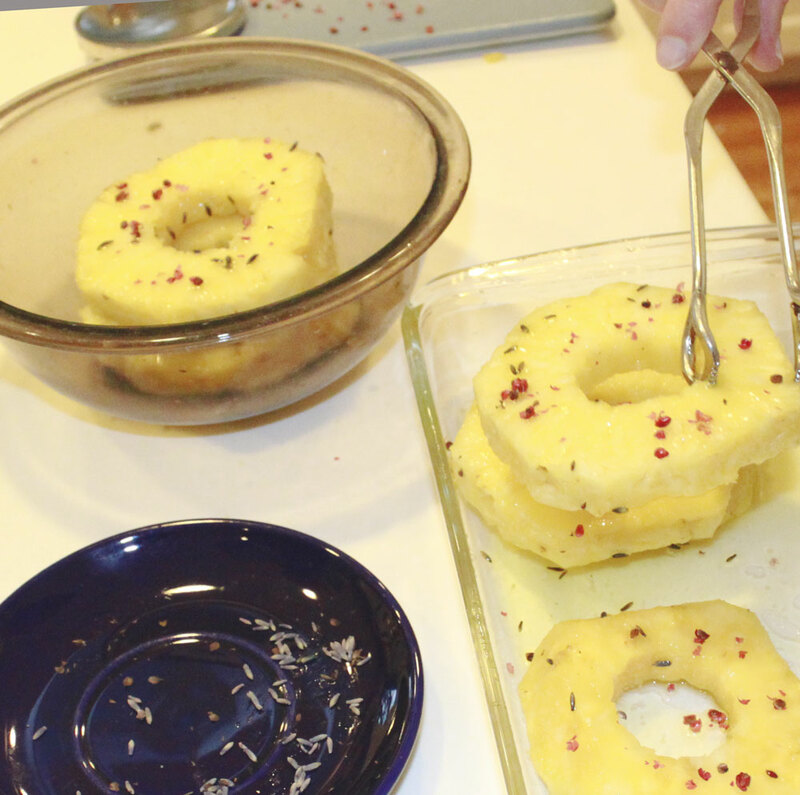 Serve on bread, pear, or apple slices. 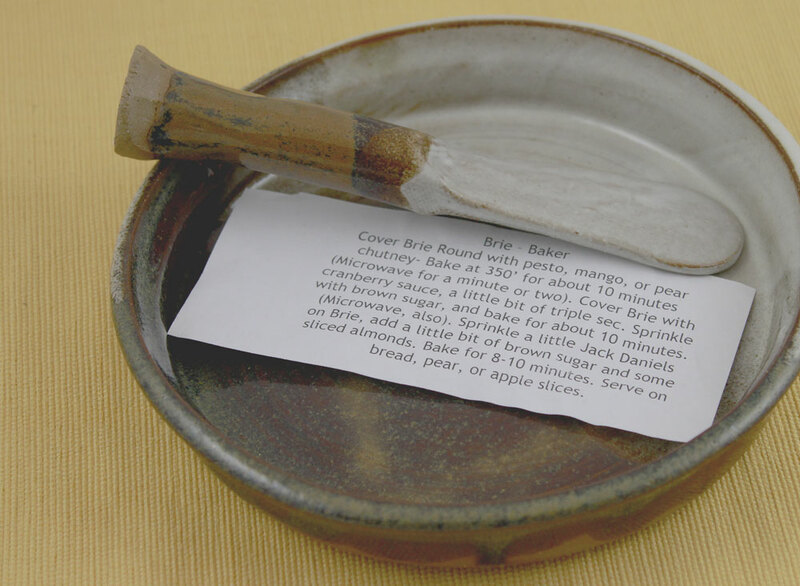 What a nice touch to include some ideas for baking brie! 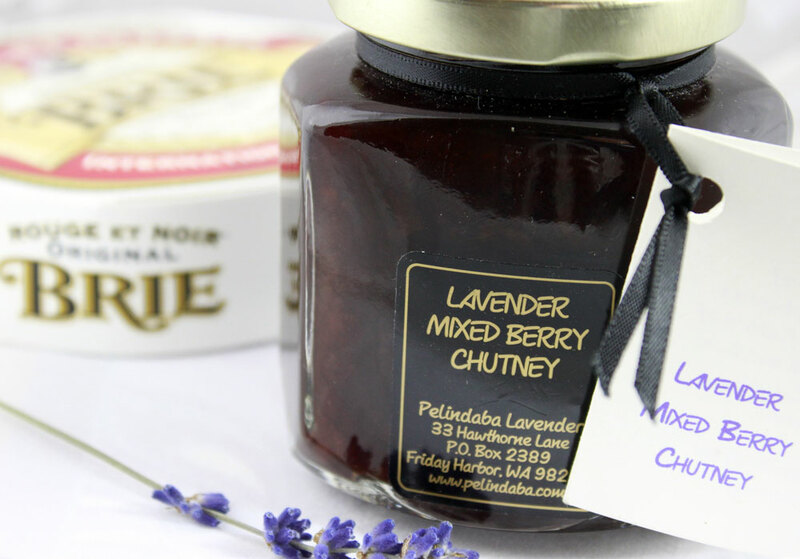 I decided to top my brie with Lavender Mixed Berry Chutney made by Pelindaba. Pelindaba is a lavender farm on San Juan Island. The name of this farm Pelindaba is the Zulu word for “Place of Great Gatherings”. Stephen Robbins, the owner of Pelindaba, has committed to keeping his 20 acre valley property as open space for “great gatherings of crops & great gatherings of people”. To learn more about his philosophy, click here. 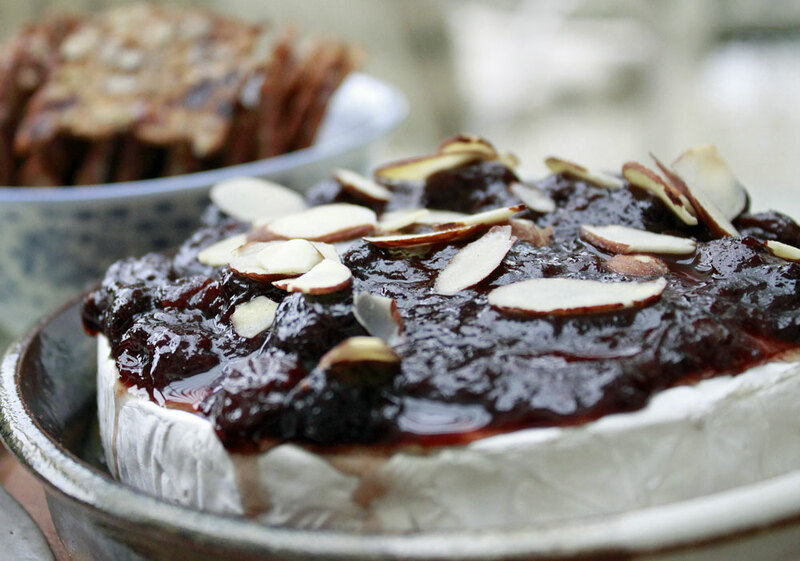 My birthday led to a Brie Baker, the Brie Baker led to this flavorful chutney made by the folks at Pelindaba, and the recipe that came with the gift led to Baked Brie with Lavender Mixed Berry Chutney. When I opened the oven door to take out the cheese, the fragrance nearly knocked me over – sweet lavender and summer berries filled the air. When I put the knife into the warm cheese, it was creamy and warm. Then I spread the cheese covered chutney on a cracker and popped it into my mouth. All I can say is it was fantastic! Now my hope is this blog post leads you to experience Baked Brie. I would love to know what you topped yours with. Next time I want to try the Jack Daniels with brown sugar! 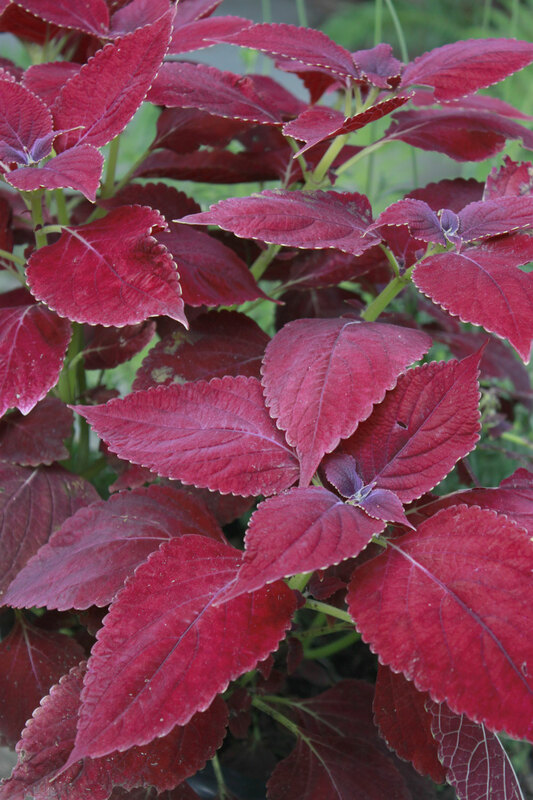 This Lamiaceae family is also known as the mint famil. With 263 genera and as many as 7200 species, this family of flowering plants is a big one, however not the largest. That distinction belongs to the sunflower family with approximatly 24,000 species. Plants in this family are aromatic. Many culinary herbs such as rosemary, lavender, sage, savory, marjoram, oregano, thyme, basil, mint and lemon balm belong to this family. 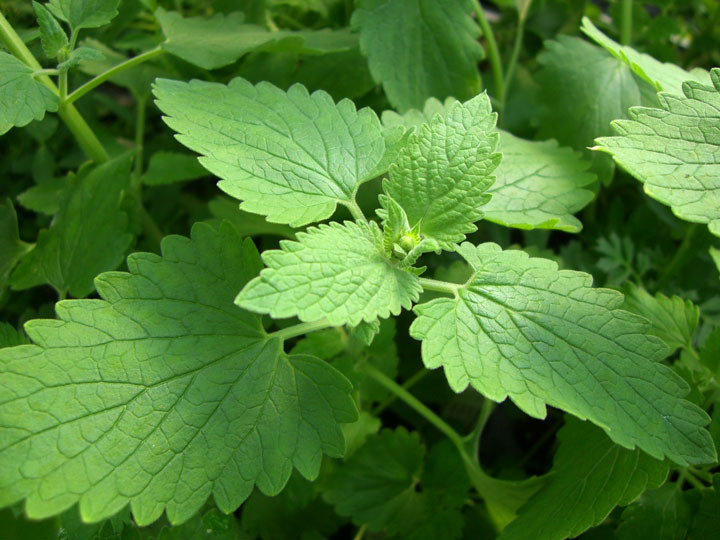 Mentha, otherwise known as True Mint, is a genus belonging to this family. “The Northwest accounts for about 80 percent of the total U.S. mint crop”. (http://www.capitalpress.info/idaho/dw-mint-harvest-w-art-092410) Yakima Valley is the largest producer of peppermint and spearmint oils in the USA. Distinguishing family characteristics include equal and opposite leaves, square stems and lipped flowers. Some members of this family such as bee balm, salvia, hyssop and phlomis add color and beauty in perennial gardens. These are known as ornamental mints.